Jamee Williams, LMT, joined our team in 2015. 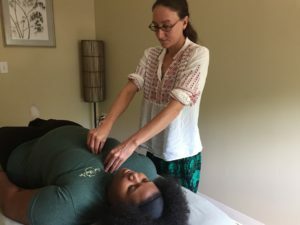 She is one of the most unique individuals we’ve ever met and her clients love the way she infuses Eastern modalities like acupuressure and Shiatsu into her sessions. Where and when did you receive your professional training? I graduated from Body Wisdom Massage Therapy school and became licensed in 2015. Prior to that I had been working in healthcare as a CNA since 1998 and also a CMA since 2005. I offer all of the massages available at East Village Spa including prenatal and “Two Feet Deep” barefoot bars massage, but my true passion is for Shiatsu, cupping, and acupuressure. I have traveled to Hawaii to study Shitasu and cupping from Shinzo Fujimaki, a renowned expert. Why did you become a massage therapist? I worked with seniors and hospice patients for 17 years as a healthcare provider and wanted to do more to relieve pain and anxiety without resorting to medication. What are your favorite ways to reduce stress? I love travel, yoga, hiking and camping. I find that the more coffee you drink in exotic locales, the more the human experience sinks in, and skills and knowledge evolve from there. There are many factors, responsibilities and expectations making up our daily lives that it is easy for our perspective to become cloudy and for us to lose sight of our true selves. The modalities that I specialize in are focused on meridian work, which is centered around helping you to release unwanted baggage that no longer serves you and holds you back from finding joy in your true self. It is important to be able to relax, unwind, and be genuine. I want to provide a safe, secure environment to let go and find relief from physical or emotional pain. What are guests saying about Jamee? To book a massage with Jamee, click here! To ensure that your service is marked as a request, select “Specific Therapist” from the drop down menu, then select Jamee’s name to see her openings. This will indicate to the desk that you intended to request Jamee.